Wild Cougar [Power Pay] © 2006 Aristocrat. This game is identical to the original "Wild Cougar" when not using the Power Pay feature. Other Power Pay games are : "Black Rhino [Power Pay]" and "Wicked Winnings II [Power Pay]". The Power Pay button, if toggled on, doubles your total credits bet. Power Pay gives you the chance of winning free games. 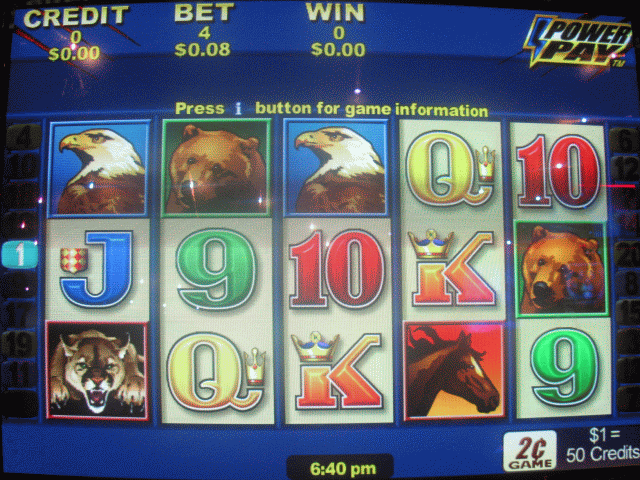 If a Cougar and/or a [scatter symbol] appear on both reels 1 and 5, you are awarded with 15 free games. You win a bonus of 2 times you bet before the free games start. During the free games, a random multiplier comes up for each win, similar to the 'Spring Carnival' or 'Roll Up! Roll Up!' feature. If you only have 1 credit left and can't hit the minimum bet to get rid of it, check to see Power Pay isn't enabled, since it doubles your bet.